Roger Gehrig studied singing and guitar in Stuttgart as well as German and music education with Carmen Mammoser, Johannes Monno and Tillmann Reinbeck among others. In the end of 2015 he finished his studies with a Master degree in Concert Singing. He supplemented his training by participating in various masterclasses. He worked as a soloist with ensembles such as the South-west German Chamber Orchestra, The Barock Orchestra Musica Baltica, the International Bach Academy Stuttgart and the Württemberg Chamber Choir and has given concerts abroad in Japan, Austria, Hungary as well as on tour to Italy with Bach’s B Minor Mass conducted by Helmuth Rilling. His artistic activities are widely varied, ranging from oratorio soloist (Baroque Evangelist to late Romantic tenor solo parts), staged opera productions (such as Tamino in Mozart’s The Magic Flute and Frederic in Sullivans Pirates of Penzance) and song recitals in which he accompanies himself on the guitar. 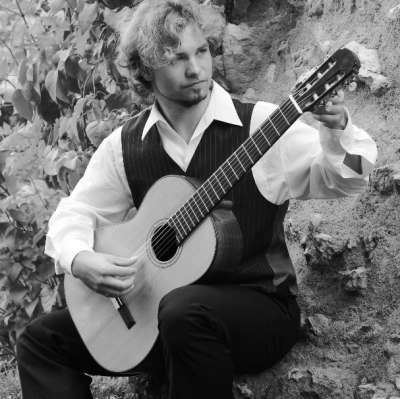 He has performed at festivals in Budapest, Bologna, Heidelberg, Wetzlar and Bad Hersfeld among others and was a prize-winner at the International Okiden Sugarhall Music Competition in Japan, the International Singing Competition for Sacral Music cantateBach at Greifswald and the International Competition for Liedduo Rhine-Ruhr. 2010-2015 he taught at the University of Music at Stuttgart as a tutor for singing, guitar and music education. 2011: 3. Music Teacher Competition in Stuttgart: 1. Prize; with recital "John Dowland de Lachrimae"